काउंसलिंग हेतु समय सीमा का निर्धारण Counseling for the Post of BTM is Scheduled on Dated 06.02.2019 and 07.02.2019 from 10.30 AM to 5.00 PM. Venue :- Rasayan Bhawan, Mithapur Farm, Patna-1. Please come along with Two Passport Size Photographs and all Original Certificates/ Documents. ATM Counseling for the Post of ATM is Scheduled on Dated 08.02.2019, 09.02.2019 and 11.02.2019 from 10.30 AM to 5.00 PM. Venue :- Rasayan Bhawan, Mithapur Farm, Patna-1. Please come with Two Passport Size Photographs and all Original Certificates/ Documents along with one set zerox copy of original docouments, original id. Counseling for the Post of BTM is Scheduled on Dated 06.02.2019 and 07.02.2019 from 10.30 AM to 5.00 PM. Venue :- Rasayan Bhawan, Mithapur Farm, Patna-1. Please come along with Two Passport Size Photographs and all Original Certificates/ Documents. Counseling for the Post of ACCOUNTANT is Scheduled on Dated 12.02.2019, and 13.02.2019 from 10.30 AM to 5.00 PM. Venue :- Rasayan Bhawan, Mithapur Farm, Patna-1. Please come with Two Passport Size Photographs and all Original Certificates/ Documents along with one set zerox copy of original docouments, original id. 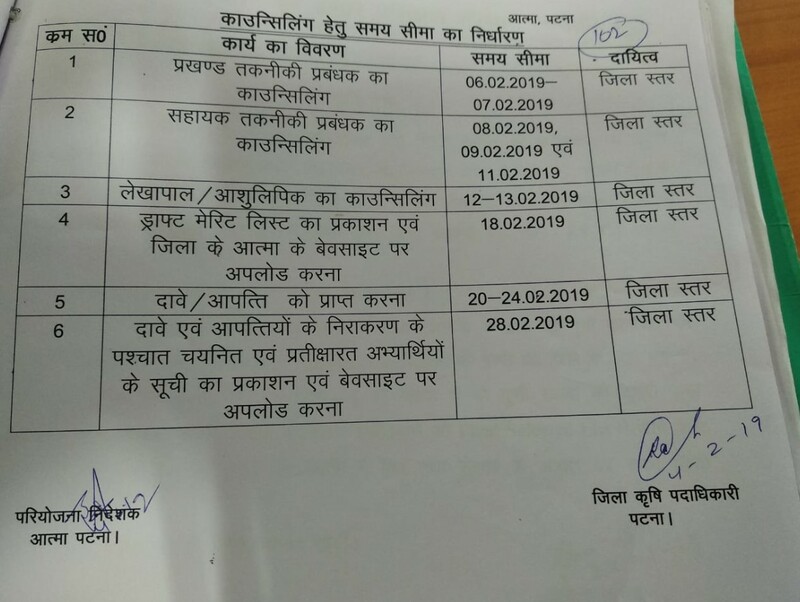 Copyright © 2019 Agriculture Technology Management Agency, Patna	.